Jewelry category is now closed! This annual show--now in it's 12th year-- is held on the grounds of Bar Harbor's premier shore-front luxury hotel; The Bar Harbor Inn, strategically located in the middle of town on the harbor waterfront. The show has an established draw with both repeat customers and artists and features a balance of mediums exhibited. Jurying will be by periodic "rolling jury"
Artists will have 2 weeks upon invitation to confirm with payment of their booth space. This enables traveling artists to "lock-in" their space and plan for lodging in advance. After 2 weeks the invitation is still valid provided that spaces are still available in the medium category. Medium categories are limited to provide a well-balanced show for both artists and customers--categories like jewelry tend to fill quickly. Applications are accepted only on-line through Zapplication. 5 images of art and one of booth (showing actual shelter and representative art displayed) is required for each category submitted. Attention should be given to the artist's statement. Artists may apply in different media categories but can only exhibit artwork in the category for which they are accepted. Exhibited work must be substantively similar to works submitted for jurying. All artworks displayed and sold must be substantively produced by the hands (using traditional non-computer assisted or mechanical means that remove the actual guidance of the artist's hands) of the applying and participating artist. Individual artworks must contain at least 50% original work by the artist (no more than 50% may consist of repurposed or otherwise not made by the artist's hands components) No reproductions (other than those excepted in the policy below), digital output (except for digitally manipulated, limited-edition photography as noted below), mold-made or buy-sell art of any kind is permitted. 2D works must be tastefully framed and hung on booth walls, with only 1 rack permitted for loose unframed items. Sculpture, 3D works and jewelry must be tastefully arranged on covered tables or pedestals. Loose artwork may not be displayed on the ground—whether free-standing or leaning up against props--except if it is approved ground sculpture. Fine jewelry: All jewelry must be unique one-of-a-kind items hand-produced by the exhibiting artist. No mold-made or repeated items with only slight variations permitted. Hand-pulled printmaking: Original hand-pulled prints, signed and numbered by the exhibiting artist. Acceptable techniques include intaglio, lithograph, monotype, collograph and other techniques. Please call if in doubt. Graphics and 2D mixed-media: hand drawings, pastels and collages, 2d glass and mosaic work. Please call if in doubt. Painting: Includes watercolor, oil, acrylic, gouache and other painting mediums. Fine photography: True limited-edition photography of high quality. See below*. Fine Wearables: Hand-made clothing items. These must be entirely hand-produced by the artist and not simply be variations on repeated items. Sculpture, Glass & 3D work: Sculpture must be hand-produced by the artist from wood, stone, clay or other acceptable media. Loss-wax technique from a mold is permitted as long as the original sculpture was produced by the exhibiting artist and the mold was produced under the artist's direction. 3D assemblages from metal, wood and other materials are permitted, as well as original glass-work produced by the exhibiting artist. Digital Art: Any art that uses computer files and/or a digital output device in it's creation. Digital art may not be represented as "limited-edition" and if more than one size are displayed the largest size must be framed and displayed on booth walls. Artists found in violation of any of these requirements during the show may be asked to remove offending items or ejected from the show. No refund will be given an artist found in violation of show policies. *Note about photography/digital art: Because of the spread of digital and other "mass produced" means, digitally-printed photography does not fall under the guidelines for original, one-of-a-kind or true limited edition art. Any artform that is now printed using any digital file/printer/device is now categorized as digital art. Fine photography is hand-produced/manipulated photographs in the printing process. Digital artists must conform to the same regulations that govern 2d reproductions. 1. The reproduction must be of a framed available original on display in the booth. In other words, the reproduction image must be identical to that of the original on display in the booth. If the original is not on display, then the reproduction image may not be offered for sale. 2. The reproduction must be of equal size or less to that of the original, and available in only one size. 3. All reproductions are to be stored in ONE rack only in the display booth--and the reproductions must be clearly marked as "reproductions." 4. Reproductions MAY NOT be referred to as "limited editions prints"--even when numbered. This is a term of art which is reserved for true limited edition prints such as hand-pulled original etchings and lithographs. 5. 2D artists may display up to 1/3 of their toatl framed wall display with reproductions of the same media they juried in with. The framed prints must be clearly marked with pricing info as being "reproductions." Jury/application fee is a non-refundable $35.00. Jurying is on-going up to the final jury date. An artist may elect to "lock" their participation by confirming acceptance and payment within two weeks of invitation. Each regular space is 10 feet in front by 10 feet on the sides with some space for storage between and/or behind booths. Work must be contained within the assigned space. Only one artist permitted per space, unless a two-person team qualifies as a dual entry, in which case both artists must be present for the duration of the show. Artists are required to set-up in the designated space assigned to them by the show director. Failure to adhere to the designated space boundaries may result in the artist(s) being required to reset their display or required to leave the show. Please note that all spaces must have white, 10 x 10 shelters with matching 4 walls for protection as the weather can change quickly and to maintain a professional appearance. This is a weights-only show (minimum of 30 lbs weight on each corner)--absolutely no stakes, nails, screws or other devices may be used to secure anything to the show's driveway or other structures. ONLY booth spaces on grass areas (spaces with electricity) may use stakes. The drive and property have areas of gentle slope--be prepared to shim your display if necessary. Artists must exhibit and be present throughout the three days of the show as noted in the show schedule. Failure to comply with this rule may result in ineligibility for any awards and/or admission to future shows or may be grounds for dismissal from the show without any refund. Only artists displaying their own original work may participate. No stand-in or proxy exhibitors will be allowed to represent the artist. A driver’s license and/or additional photo identification may be required at check-in. Artists must comply with state law regarding collection of appropriate sales tax and file returns with the state of Maine. Consumption of alcohol is strictly prohibited in the artist's display area as it violates the zoning requirements for the Bar Harbor Inn. The Inn has it's own bar area--as well as several bars immediately across the street--for legal alcohol consumption. Please submit questions to: in_a_cloud@hotmail.com or call 207 266-5884. Acceptance and payment of booth fees means that the artist has read, understands and agrees to comply with all the rules and conditions as described on this application and the show website. Artists that cancel participation may receive receive credit towards the next year's show in the amount of the applied year's fee provided cancellation in received in writing or e-mail at least 45 days prior to the show. There are no refunds of any kind for cancelations made between 45 days prior to the show and the show dates. No exceptions. Stakes may be used ONLY on the grass spaces with electricity. All other spaces are weights-only, shelters must have a minimum of 30 lbs weight on each of ALL 4 corners of their booths. Shelters must be sturdy (able to withstand significant wind-loads) white tent or dome type shelters with 4 white walls. No generators are permitted or music sources that can be heard beyond the artist's space (except music provided by the show). Battery inverter packs are allowed to power lights. Some spaces may have a slight slope so artists may need to have shims to level their displays if they need to. All artists are expected to conduct themselves in a professional and cordial manner at all times--we are all in this together and what you do affects your fellow artists! 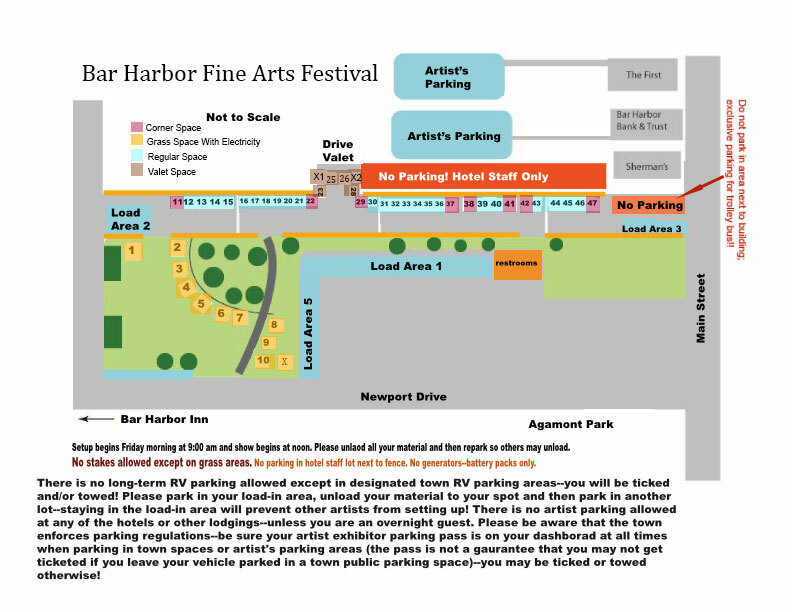 Artists must adhere to all parking regulations and restrictions during all hours of the show. Artists may request specific space assignments and in most cases the show director will do his best to accomodate those requests. This is provided as a courtesy to the artist--buit is not a "gaurantee" that the artist will get the exact spot they request at the time of the show. Because of changing participant numbers, cancellations and other factors--the director may have to re-assign a space or move existing spaces around in order to adjust to the changes. Show director reserves the right to change participating artist space assignment if necessary with no compensation to the artist (howver, the artist will still receive the space type that they paid for). Artist has read, understands and agrees to all the rules, requirements and restrictions as outlined in the show application material. Artist agrees that all work displayed is to be original, hand-produced artwork by the exhibiting artist that applies to and attends event (reproductions allowed only as outlined in the show description). Artists in violation of any of these criteria may be asked to remove items or be asked to leave the show and will not receive any refunds. Artist also agrees to abide to all display standards, including shelter types and presentation of media. Refunds are only only in the form of credit for next year's show--no refunds of any kind are allowed if an artist cancels participation for any reason within 45 days of the show start date. Unfortunately there can be no exceptions due to illness, emergencies etc. While over-night security is provided by the show, artist's assume all risk for their material, equipment and artwork in the event of damage or theft.